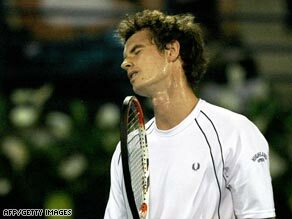 (CNN) -- Andy Murray has withdrawn from the Dubai Open tournament after coming down with a virus. Murray revealed he has not been feeling at his best since last month's Australian Open. The second seed, and world number four, was due to meet France's Richard Gasquet in the quarterfinals but pulled out shortly before taking to the court. Murray has also been suffering from an ankle injury which forced him out of last week's event in Marseille and affected him in his first-round win over Sergiy Stakhovsky on Monday. Murray had powered past Frenchman Arnaud Clement in the second round on Wednesday but revealed he then had a rough night, and explained his health had not been at its best since the Australian Open. The Scot won the ABN AMRO event in Rotterdam earlier this month, but told Sky Sports News on Thursday: "I've not been feeling particularly well since Australia. "Last night after my match, I felt really bad. I had some antibiotics from the doctors which didn't really help too much. "I woke up this morning sweating and I went back to bed for another three hours from 12pm to 3pm. Nothing has worked so far." Murray plans to return to his London base and will allow himself some relaxation time. He added: "I'm going to try to take a few days off. I'll probably go home and just rest. "I've obviously played a lot of tennis in the last few weeks and months and I hope I'm going to feel better in the next week or so." Meanwhile, there were no surprises in the remaining quarterfinals with all three matches going according to the formbook. Top seed Novak Djokovic remains the firm favorite to win the tournament after beating Croatian fifth seed Marin Cilic 6-3 6-4. Third-seeded Frenchman Gilles Simon beat compatriot Fabrice Santoro 7-6 6-1 while fourth seed David Ferrer of Spain claimed a 7-5 6-1 victory over Russian sixth seed Igor Andreev.